Hello again, hi there, ALOHA! On Monday, the King and Queen of the Netherlands welcomed the President and First Lady of Greece at the start of their official visit to the Netherlands. This dress surely makes a statement, and that statement is: WHEN DOES MY SUMMER HOLIDAY START? Listen, W-A, when she starts fashioning the beach towels into dresses, it's probably time to get the lady to a beach already. 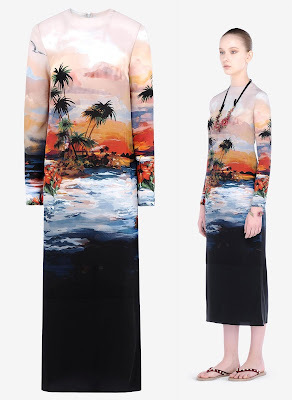 Really, I'm not opposed to a mural print on a dress. (You remember the Van Gogh dress, don't you?) And I'm not necessarily opposed to some palm trees during an official visit, either. It's just that this dress both needs that belt, being that it is the tricky combo of straight + below the knee, and actively rejects that belt at the same time. It's a dilemma.